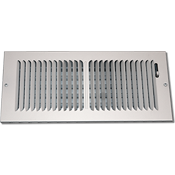 Hard-to-find large wall vents available in 12 sizes. This white steel sidewall / ceiling register has a mutli-shutter damper for complete air control. **These large wall vents are a non-stock item and have an approximate 4-6 week lead time. Tip: When ordering your metal air diffuser, you must take the measurement of your wall or ceiling opening. Do not measure your old registers faceplate. The 18 x 6 ceiling register will fit into a hole which measures 18 inches wide by 6 inches tall. The faceplate will measure slightly larger. Check out standard size sidewall/ceiling registers we have available. 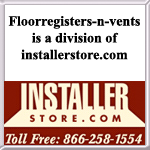 Order this large wall vent and replace your dented existing registers.